Kamagra Polo Chewable Tablets are the very latest product from Ajanta Pharma, contains 100mg sildenafil citrate and gets to work immediately, effetive in around 10 minutes and lasts for 4-6 hours. Available in Strawberry & Lemon or Pineapple & Mint flavours, packaged in a handy tube containing 7 chewable polo tablets. 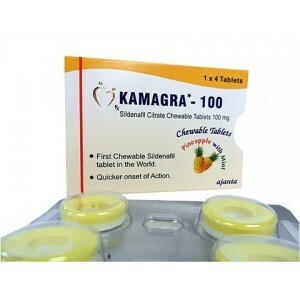 Kamagra (Sildenafil Citrate) is the generic version of the popular treatment for erectile dysfunction, Viagra™. However is available much cheaper. The medicine is manufactured by Ajanta pharma in hi-tech clinically clean facilities to ensure the end product is completely safe and contains 100 mg of Sildenafil Citrate. The treatment is suitable for most apart from users already taking or planning to take Nitrate based medications. (See our list below or consult your GP if you are unsure about medicine you may already be taking).